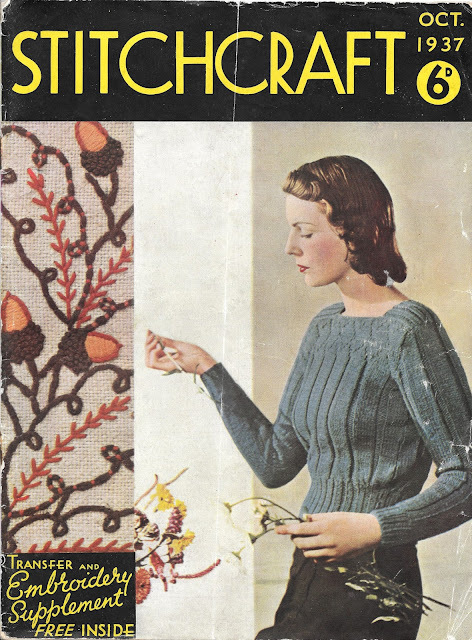 It's about time I did a Knit List - whittling down hundreds of my patterns to just ten of my must-knits. Ten? Impossible. I'll do fifty. More achievable (though not all in one post, of course!). I've got so many patterns going round in my head, they are getting tangled up in there. It's not a very tidy, organised place my head. Neither are my patterns for that matter. Which is why I need to get down my wish list of knits - the knitteds that I just HAVE to make - so I can easily reference them in a calm and unemotional way. Not in the usual, frantic, just-seen-a-jumper, scrabble-about-for-enough-wool, don't-bother-with-a-tension-swatch and just-dive-in kind of way, which is how I seem to approach pattern choice. I'm going to have to do a top fifty, because I just can't whittle it down any further. I will spread it over a good few blog posts. 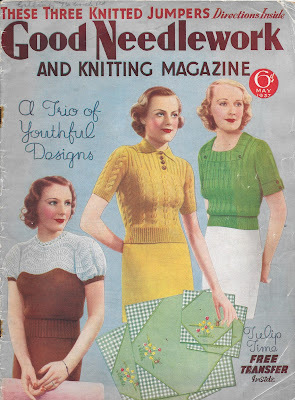 although I probably have nearer to one hundred that I just NEED to knit, but who's got that kind of time? Or wool? (Well, I probably have enough of that). I will begin with Good Needlework magazine, as it is one of the best magazines from the glory years of the 1930s for knitwear design. Not only were the patterns shown in full colour, (often super bright colours), but the patterns often gave alternative colour schemes for the designs - right down to the shade of stockings! This is a design in 2 ply, with a very interesting shape. It is in 'bluebell' stitch, little clusters of lace. The garter stitch yoke is most unusual, but the deciding factor is the cap to match! I always try to have a hat to match a favourite vintage jumper. This jumper is from the same issue, but too good to miss out. 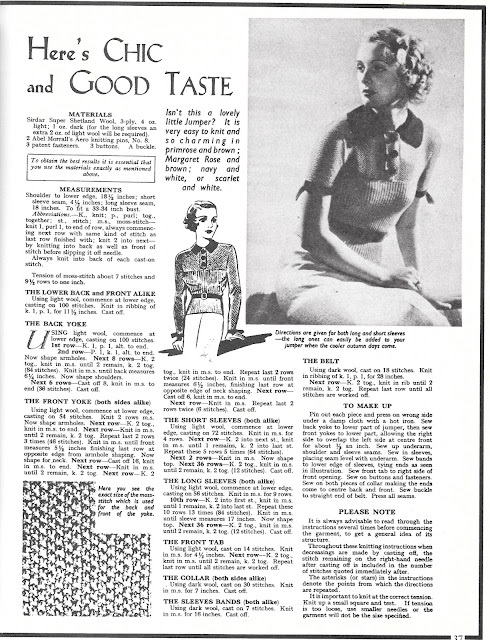 In the famous feather and fan pattern, it has similarities with a jumper featured in A Stitch in Time Vol 1, which you can see on the cover of Good Needlework 1937, below. 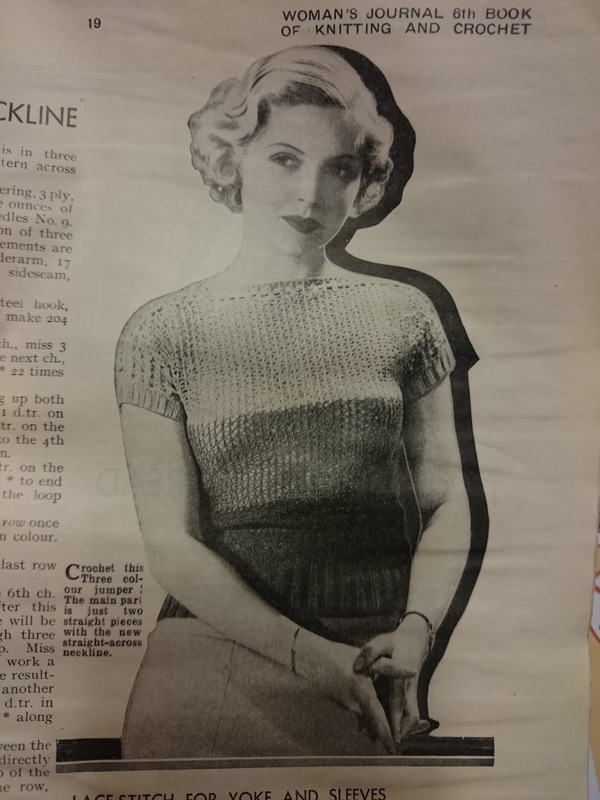 This one is in 4 ply, and has drop sleeves, as the back and front are knitted straight without armhole shaping. 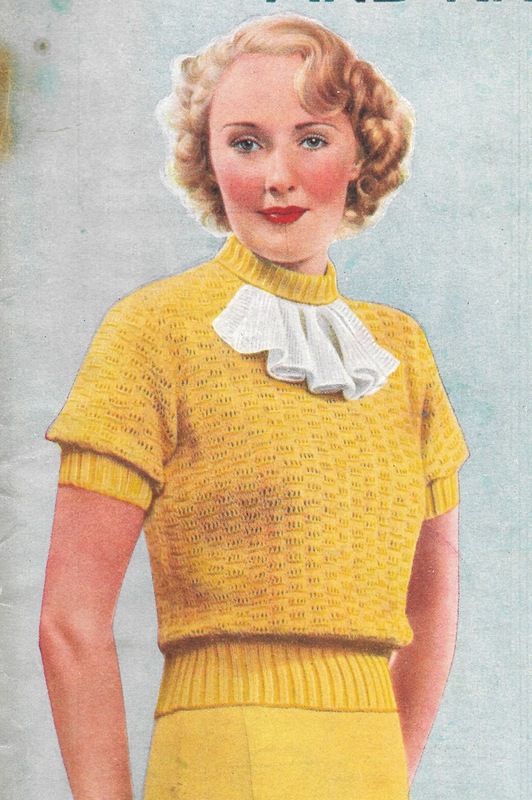 This butter yellow jumper has been in my 'queue' since I first saw this magazine. It ticks all the boxes for me. It is lightweight, in 3 ply, but knit loosely so fewer stitches are needed! Hoorah. 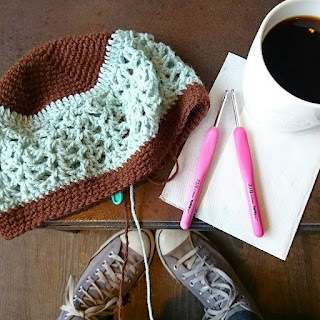 I love the look and feel of fine knitting, but I also want it off the needles as quickly as possible. The softly pleated jabot is the finishing touch. And, if that's not enough, you have the option of long sleeves if you are a 'chilly mortal'. 'What colour scheme will you choose? Skirt. 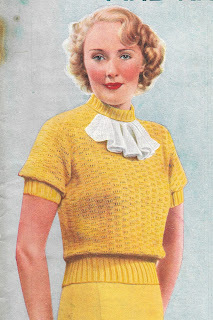 Matching yellow, Angora woolen. Accessories. Brown and white court-shoes and sun-beige stockings. Jumper. Cabbage-green with a matching jabot. Skirt. Sand-beige woollen, cut on the cross. Accessories. A wide beige belt and beige suede sandals. Jumper. Oyster-grey with lobster-pink jabot. Skirt. Matching grey, novelty woollen. Accessories. Grey coat, hat and handbag, matching pink gloves. Jumper. Navy-blue with chamois-yellow jabot. Accessories. A chamois-yellow belt. Navy-blue and yellow bracelets. 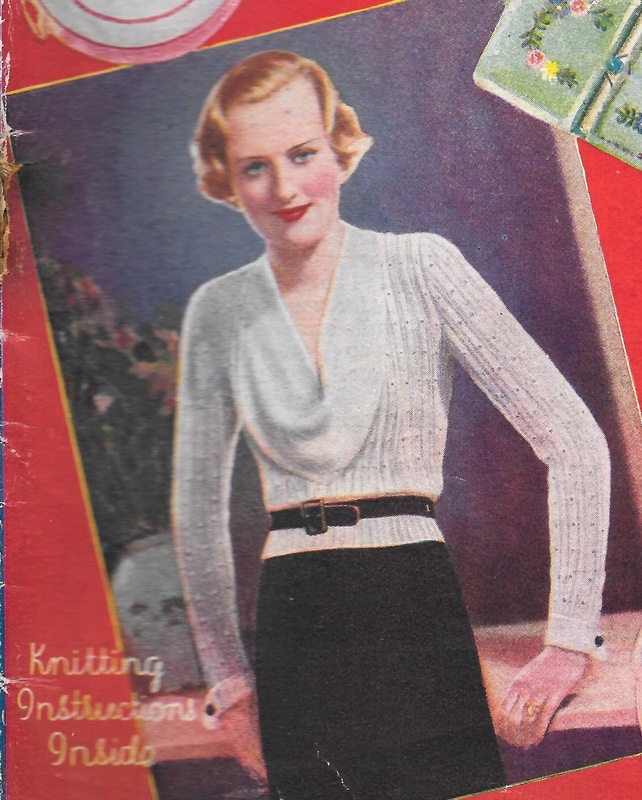 This is another invaluable long-sleeved jumper, but with a deep cowl neckline, using 2 ply wool, in a lacy, bobbly rib. The buttoned cuffs are a nice touch. And belted jumpers are just so chic. Skirt. 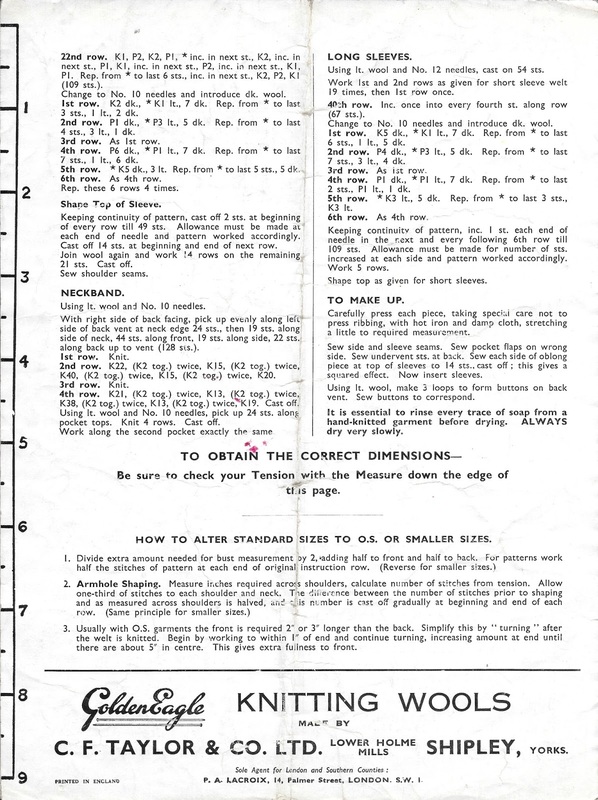 Fine black basket-weave woollen. Accessories. Narrow back kid belt. Black kid shoes. Accessories. Plaited brown suede belt. Brown suede Oxfordettes. Accessories. Navy-blue calf shoes. Wide navy-blue belt. I couldn't decide between these two (below), so they both made the cut. The one on the left (above) found it's way into A Stitch in Time Vol 1, so I've already made that. Both in 3 ply, the first has wide cables paired with a ribbed yoke, just right to wear with a 'light spring suit'. Accessories. Brown kid sandals. Yellow linen hat with brown Petersham ribbon. Jumper. Royal purple. Square glass buttons. Accessories. Beige linen shoes. Matching beige felt hat. Beige gloves. Purple handbag. The second jumper (right), has the 'New Square-Neck, quite perfect for cruising'. 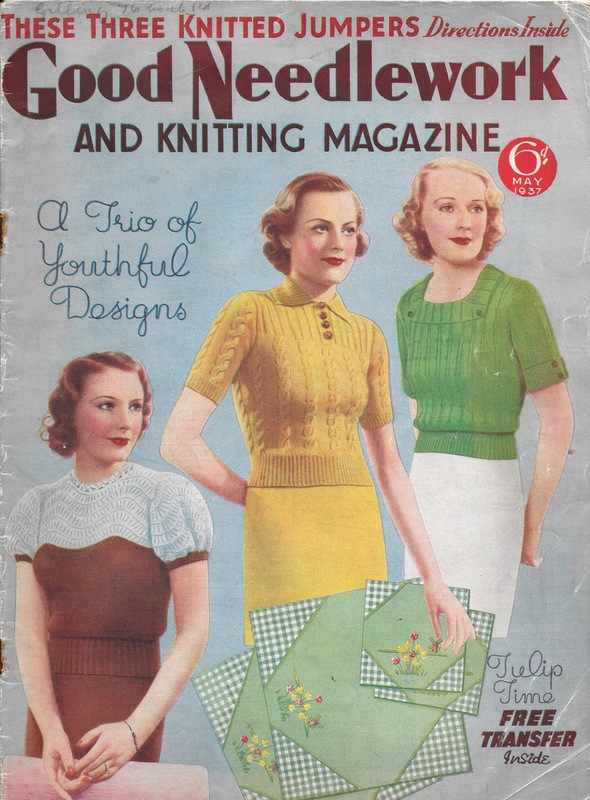 Knitted in a lozenge-like pattern, this issue has outdone itself with suggestions for five different colour combinations. Skirt. Matching grey waffle woollen. Accessories. A wide jade-green belt. Grey reptile shoes and handbag. Grey hat. Jade-green gloves. Jumper. Bright parrot-green. Matching green buttons. Accessories. Green and white kid sandals. Green, white and orange bracelets. 'Cannes' beige stockings. Accessories. Coral-pink belt and scarf. Brown kid shoes. Brown hat with coral trimming. Jumper. Misty navy-blue. White 'daisy' buttons. Skirt. Navy, red and white checked woollen. Accessories. Checked jacket, to match the skirt. Navy-blue shoes. Navy-blue hat with red and white trimming. 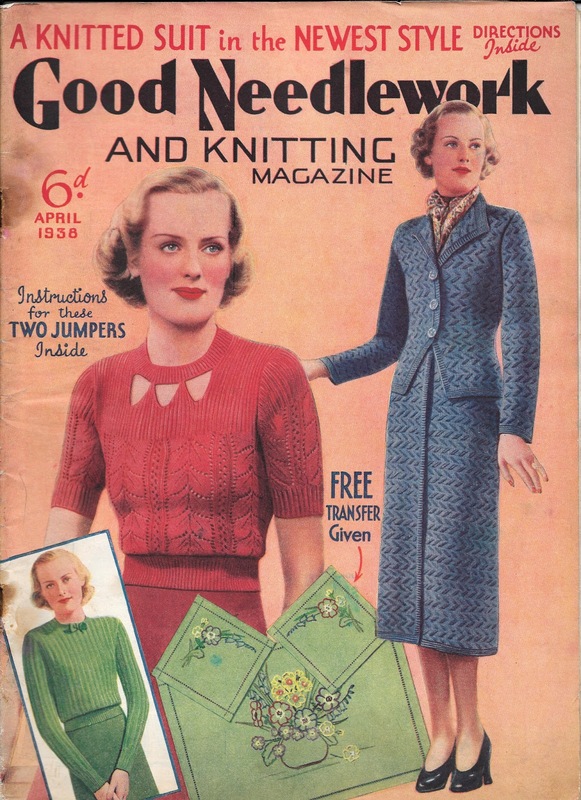 The last jumper from the Good Needlework series is from 1938. The cut-outs at the neckline were too much to resist. Teamed with leaf-patterned lace and ribbing, what's not to love? Skirt. Fine woollen, to tone, mottled with black. Accessories. Black patent-leather court shoes. Pink hat, black gloves and handbag. Skirt. Dark Ox-blood red marocain. Accessories. Matching red suede sandals, belt and pochette. Aquamarine hat with red ribbon. Seven down, forty-three to go! Jumper Jill is in four of the seven so far. I wonder how she will fare in the rest? And did women ever wear trousers? A really classic knitting pattern this month, a solid 1940s number with a sweet two-colour design and shaped rib. It even has two little pockets to add further interest. Using 3 ply wool, 3 ozs in each of two shades, one light and one dark. For long sleeves, 4 ozs of each. For a bust size of 34 - 36 inches. Needles used are 2.75mm and 3.25mm. If I didn't have such an aversion to colourwork it would go on The List. I think the longer I leave it, fair isle. that is, the harder it will be to tackle it again. It looks so lovely though. A new vintage knit, from the May 1935 edition of Stitchcraft. Called Square Yoke, Flared Sleeves. I was so eager to photograph it I took a pic before sewing on the buttons. I went for simple mother of pearl ones. 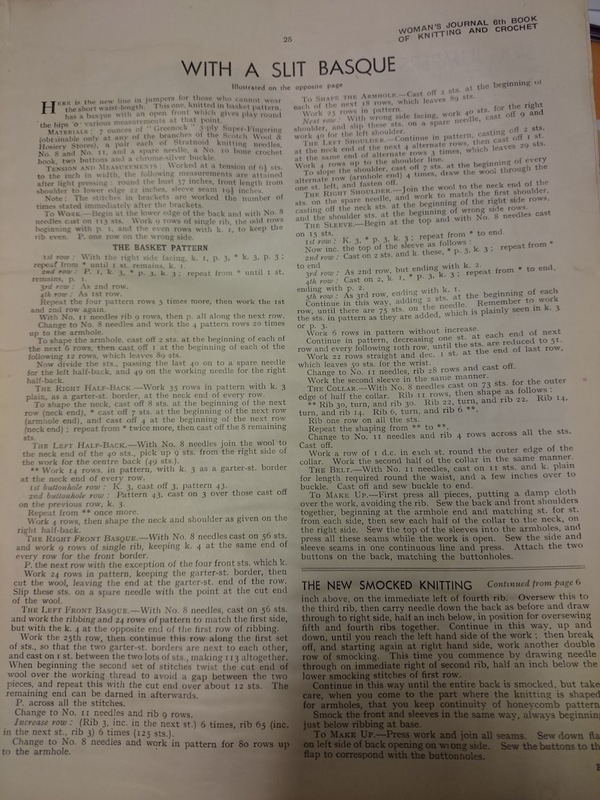 The wool used for the original was Paton's Super Brindle, which I had never heard of before. It was a little tricky to work out how to substitute. The needles used were 3mm, 3.25mm, 3.75mm and 4 mm. Tension required was one pattern repeat (9 sts), to 1.5 inches. It didn't look like a dk wool in the photograph, but more like a 4 ply. I did my tension swatch with Jamieson & Smith's 2 ply jumper wool, which I find knits to a true vintage 4 ply. It worked well, so I cast on and got going. As you may have noticed, I took these photos myself, in the mirror, so they leave a lot to be desired. I have realised another reason I love to knit these vintage jumpers is the detective work that goes into it. Trying to find the perfect yarn, the perfect tension, the perfect length. Mine has turned out shorter than the original, but it sits on my natural waist, so it is fine. I think it is actually a teensy bit snug, and that is because I didn't go up to the 4mm needles, but stuck with the 3.75mm ones, as these are what gave me the correct tension. That would explain why I only needed 6 ounces! Still, better than horribly baggy. 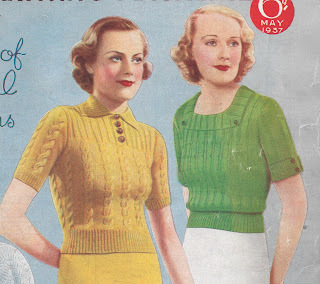 The free pattern this month is from 'Easy Stitch Jumpers', a small sized magazine that was originally a free giveaway with My Weekly magazine. It looks to be mid 1930s. This pattern is knitted in K1, P1 rib and moss stitch, it has a pretty contrast collar and cuffs, with little ties. The colour suggestions are rather fun: primrose and brown, or 'Margaret Rose' (which must mean a pink shade) and brown. Or the safe choice of navy and white, or scarlet and white. Worked in 3 ply wool, with a tension of 7 stitches and 9.5 rows to an inch. 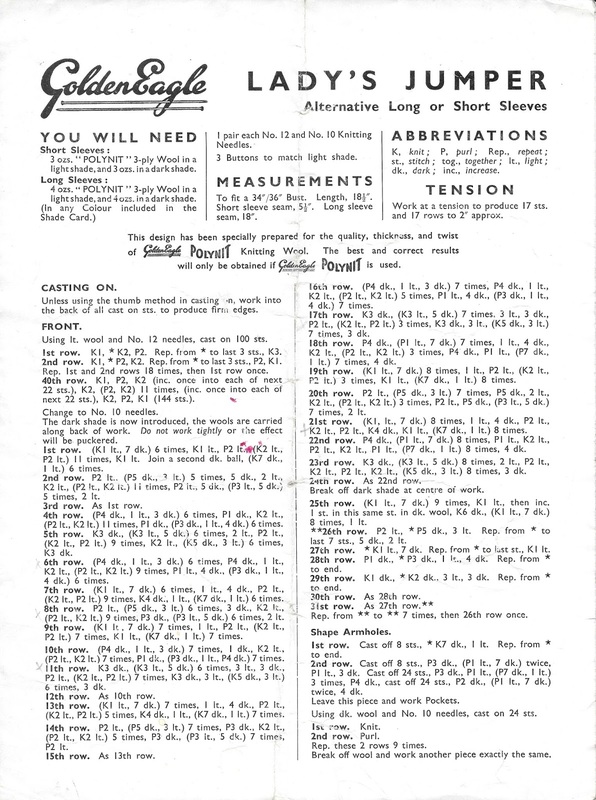 Instructions are for long or short sleeves. I am very pleased to report that my design for the Joan Crawford jacket has been reformatted and is back up on both Ravelry and on Etsy. This is a design I came up with while shooting the photographs for A Stitch in Time Volume 1 with Susan Crawford. It was heavily inspired by the silver screen glamour of the 1930s, and, in particular, the style of Joan Crawford. Her character 'Crystal' in 'The Women' was influential, along with her off-screen style throughout the 1930s. The yarn choice was easy. Pure silk. For the drape as much as for the indulgence. I wanted to create a very feminine, but not too fussy jacket, but I also really wanted to incorporate a peplum into the design. So I decided to keep the main body in stocking stitch so as not to detract from the design details. I didn't want the peplum to taper at the back, I wanted it to be quite short and flippy, with a slightly raised waistline. 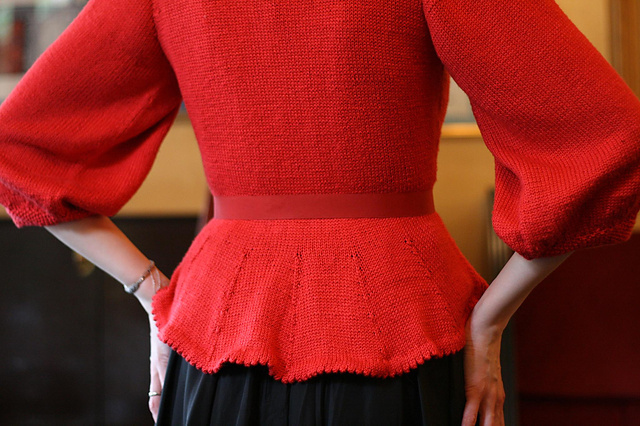 The decreases in the peplum became design features when spaced evenly and the picot edging adds interest to the hem. 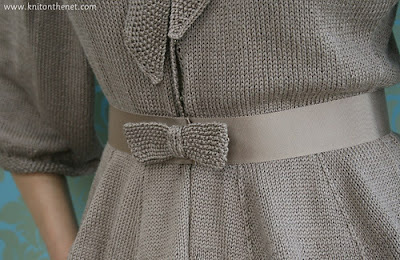 And I cannot resist a good bow, so that took centre stage on the petersham ribbon belt. The shawl collar I kept quite small and neat, knit in one piece and tapered at the ends, so that it would tie gently in front. 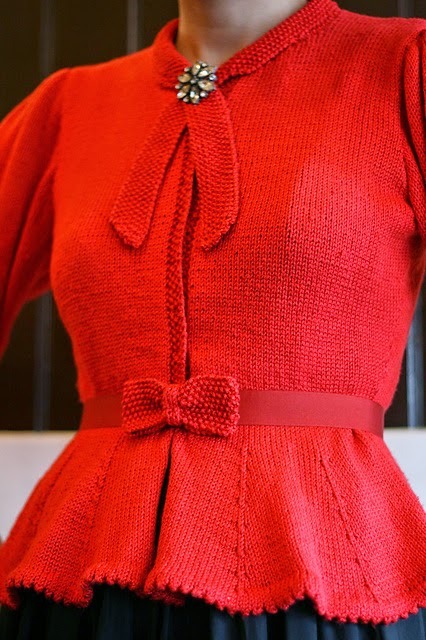 I couldn't stick just to stocking stitch, it was just a tad too dull, so I introduced moss stitch with the bow, sleeve cuffs, shawl collar and the front bands. I decided to omit buttons altogether instead using press studs, as I knew they would draw the focus away from the shape of the garment, and the discreet design features. And the sleeves? They had to be full and feminine, with a slight gather at the shoulder. Three quarter-length seemed just right. They are knit from the top down. 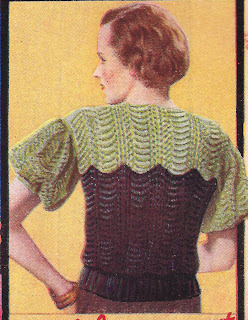 This design was first featured in the Glamour issue of knitonthenet (along with A Posy of Violets). It was Susan's first website, before she established Susan Crawford Vintage, and it showcased lots of independent designers. I have to say a huge thank you to Susan Crawford for encouraging me to release this pattern, and for the multi-sizing she did for it. 1500 metres of 4 ply in either silk, a silk mix, or cotton. 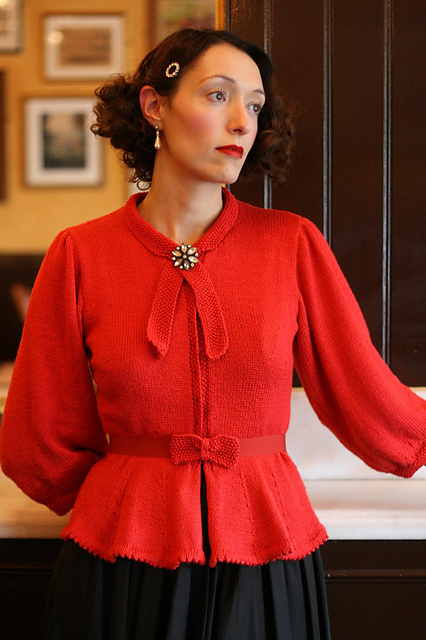 The silk used above is discontinued now, but the red silk I bought is available from Knitshop. 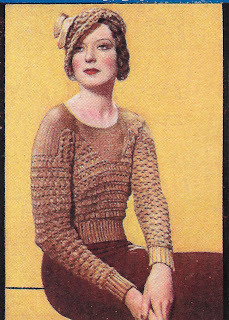 I have seen it done in other yarns too, (see version on this Ravelry page), which looks wonderful. I would also love to see how it looks in a silk and alpaca mix. Or bamboo. The drape would be lovely. 23 sts and 32 rows to 10cm/4 inches measured over stocking stitch with 3.5mm needles. It's half term this week, so I've been out and about with the children. Play dates, shopping, playing board games. It's been fun, but there has been very little time for knitting. 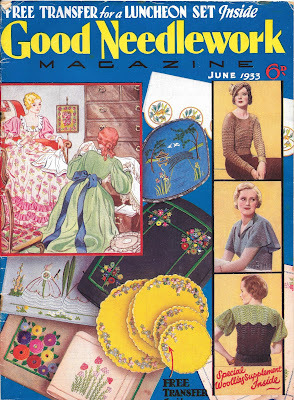 The free patterns this time are from Woman's Journal 6th book of Knitting and Crochet, from 1935. 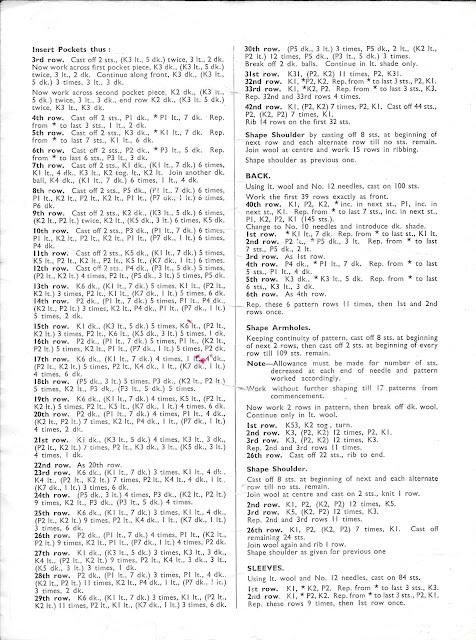 Found at the British Library, but not scans, just pics again I'm afraid. 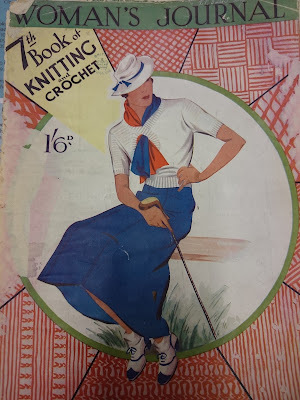 This looked interesting, as I am yet to crochet a whole garment. And why not start with a vintage one? Stitches used are dc (double crochet), and dtr (double treble). I assume it is designed for summer, with it's cap sleeves and airy pattern. So if I start now, I might finish it by June! 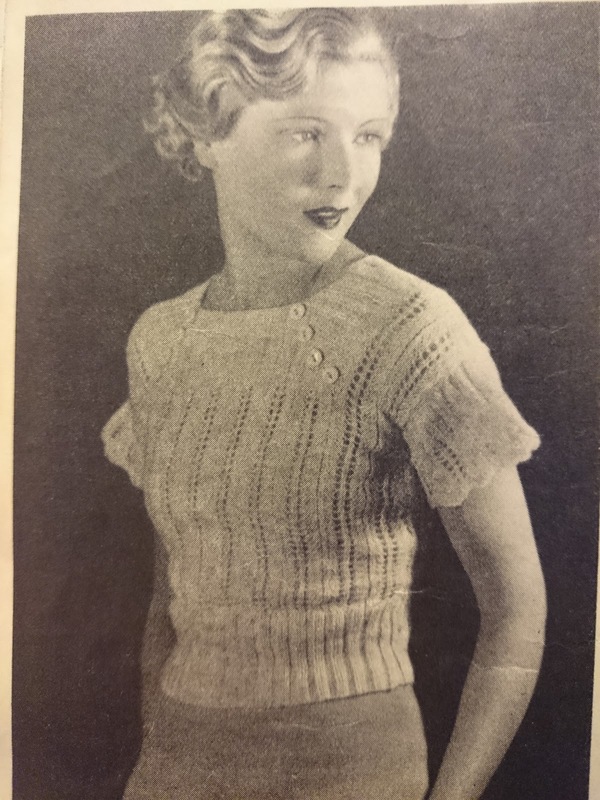 What I like is the combination of knit and crochet, with the waistband and cuffs knitted in rib, as there is really no equivalent to the stretchiness in crochet. It gives it a very professional finish. I would do it in cotton, but the original suggests wool. The colour combination sounds a little dull too. Dark brown, medium brown and fawn. Very 30s though. For the knitting pattern I chose this for the unusual shape, and the colour, I'm a sucker for bluey greens. And belt buckles! 'With a Slit Basque. 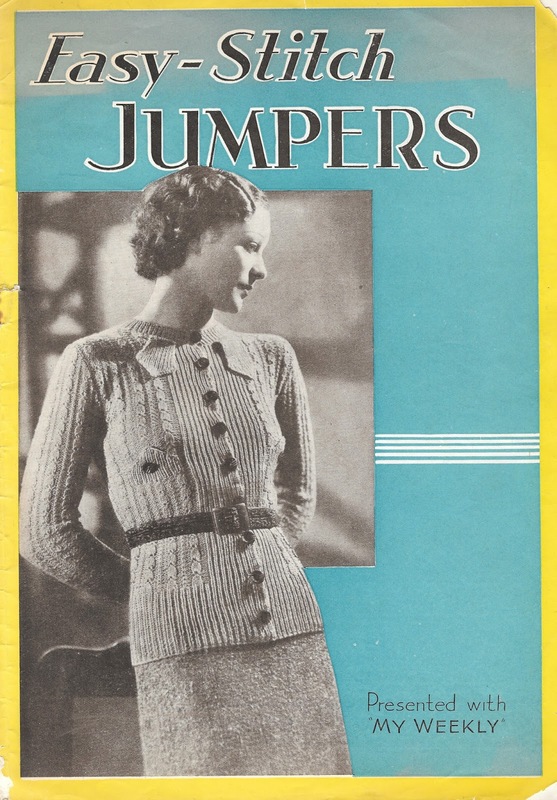 A Charming Jumper With a Waistcoat Effect. It is larger than the usual jumpers, at 37 inches around the bust. And longer, at 22 inches from shoulder to lower edge. Ah, I can only imagine how glamourous cruises were in the mid 1930s, and all the chic knitwear that accompanied them. And beach pyjamas. And evening gowns. I'm off to plan my summer cruise wear. Or maybe just clear up the mess in the house caused by children. Oh, the glamour. The moment I saw the cover of this Stitchcraft, I knew I wanted to knit it. I could see it was done in 'thick' wool, but it was also very flattering. Win win. Quick knitting, warm, and not too bulky. And finished in time for winter. It is only the second long sleeved jumper I have ever knitted, so I imagine it will get lots of wear. I was so impatient to wear it, I finished sewing it up on the tube to the British Library, and changed into it while I was there. I did get a few funny looks in the loo, as there were still a couple of ends sticking out. Thankfully, I met Caroline there (The Sunny Stitcher), and she kindly sewed them in for me. Between the rain showers this week, I got my husband to take some quick pics of the jumper in our garden. 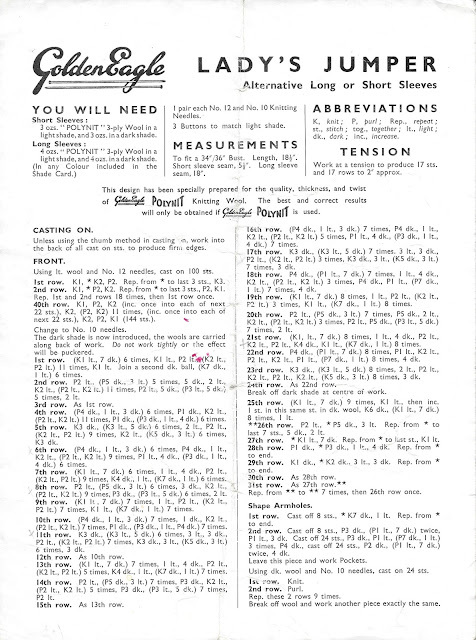 The original yarn suggested was 'Totem' by P&B. The tension required was 16 stitches to 10cm, which meant a nice aran weight yarn. I actually had some Patons Classic Wool Worsted that I'd found in the States last year, but only 4 balls. I was sure it wouldn't be enough, but as they were 100g balls, at 192m each, I thought I'd take my chances. And, as you can see, it was enough. I have possibly five or six metres left. I am often amazed at how economical vintage jumpers are with wool. That's why I'll keep on knitting them. The front yoke has a very interesting diamond pattern, and is cast off straight across. The epaulettes and back yoke are knitted separately and sewn on. I have only one niggle - the sleeves are a tad too short. I should have measured them on myself before the armhole shaping. It pulls the shoulder down slightly. I paired it with a new design called A Lacy Beret, which is an almost exact match to the shade of the jumper. I still can't tell whether it is blue or green, but I love it. I missed a blog post last week due to my frenzied making of things to sell at the E17 Designers Autumn Market this Sunday. 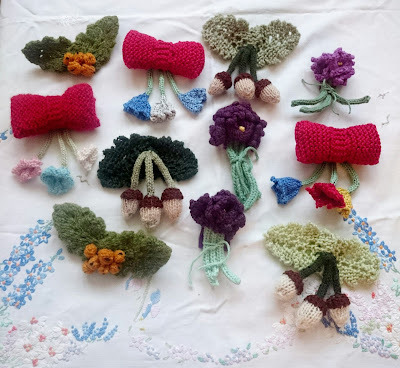 I have been putting the finishing touches to the brooches and hats I'll be trying to sell there. 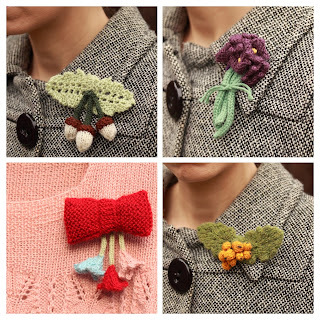 I did some 1940s style brooches, which I hope will go down well, as they would make nice gifts. At least, that's what I did with all the others I have ever made. I designed 'Posy of Violets' a good while ago now, and have added to it since, with 'A Brace of Acorns', 'Bows & Bells' and 'Autumn Berries'. 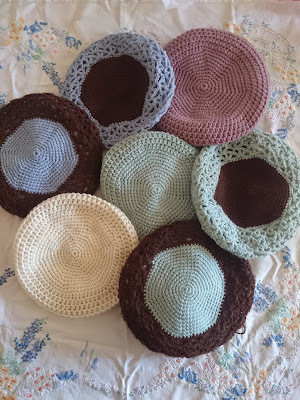 Only one of the patterns is available to buy on Etsy at the moment, so whatever I don't sell at the fair I will add to Etsy, in good time for Christmas shopping. 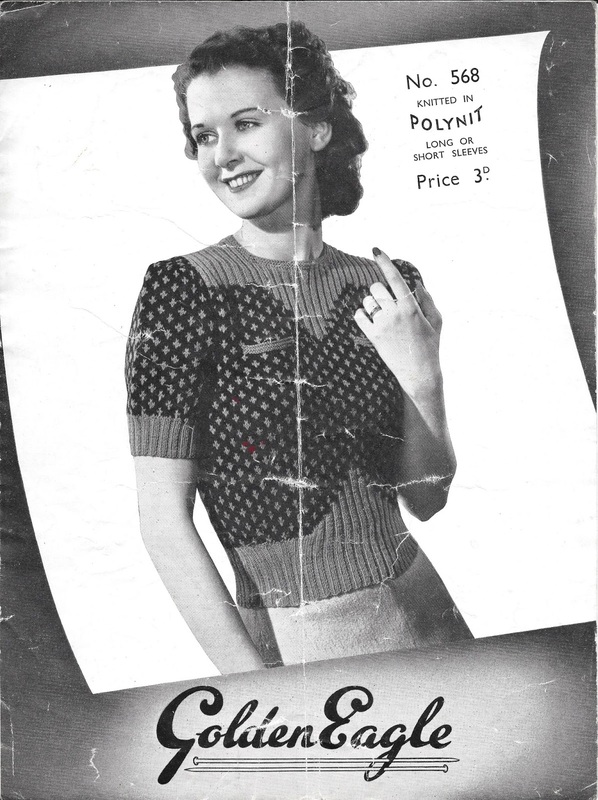 Along with the option to just buy the patterns for the others. 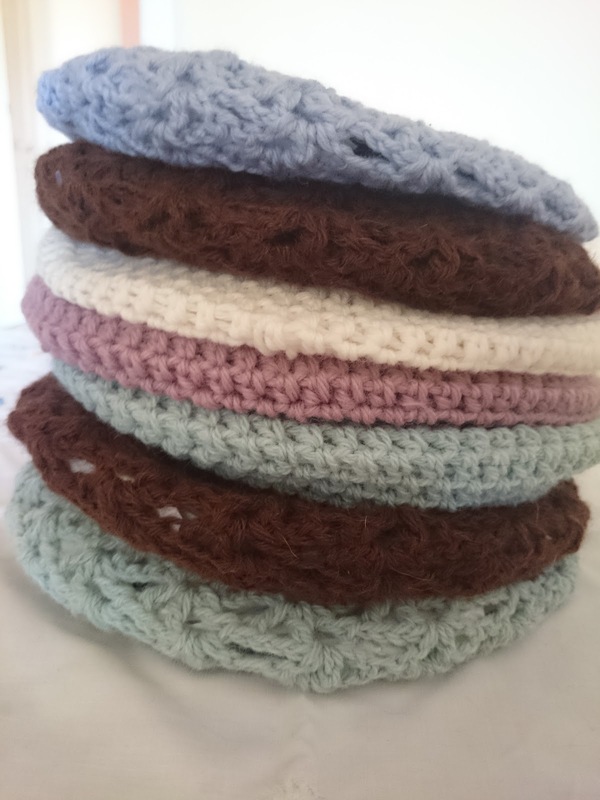 A few hats, crocheted in muted tones, with a bit of chocolate thrown in. This shot captures the colour well of what I'm calling 'A Lacy Beret'. I can't work out whether it is pale sage green, or an aquamarine blue. I don't think it really matters. It looks good with the brown alpaca. I'm doing the fair with a friend and fellow wool-head Helen Reed of The Wool Kitchen, who will be selling her urban hand dyed yarn. These are the berets I will have on display there. 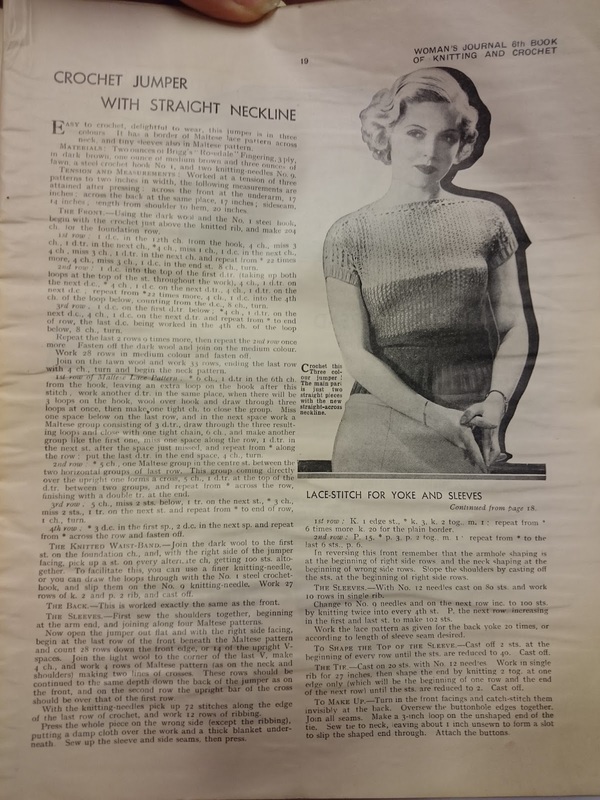 'A Draped Beret', and 'A Lacy Beret'. 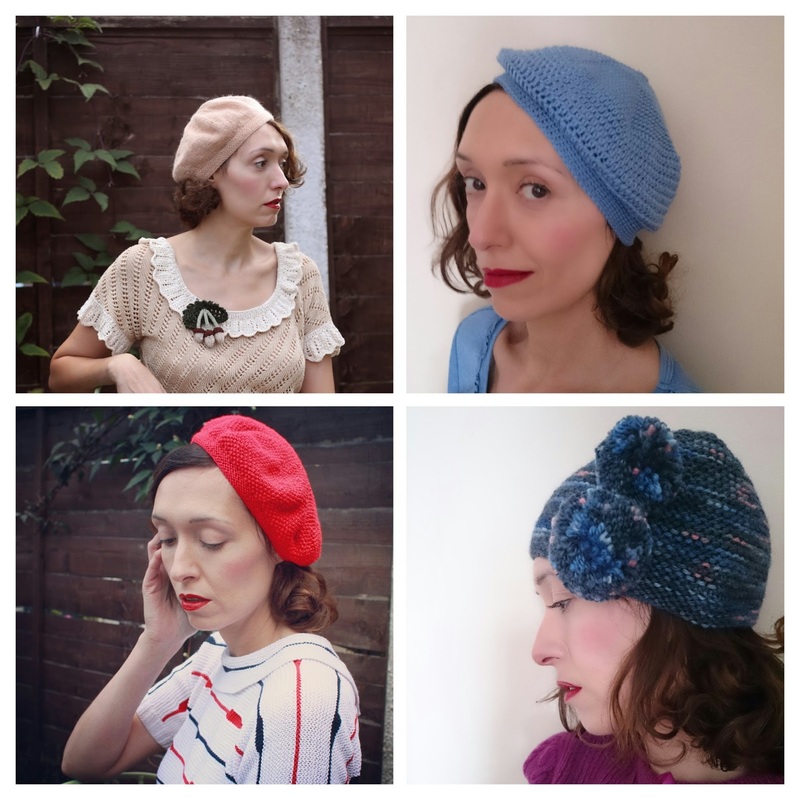 I will also be selling the patterns for the hats above - 'A Beret for Everyday, 'A Draped Beret'. 'Moss Stitch Beret' and 'Pom Pom Hat'. They are £3. The hardest bit will be no surprise to the other makers out there who try to sell - working our how much to charge. I'm still not sure, I keep changing my mind, and trying to calculate time plus materials, and balancing it with what I think people might expect to pay. Despite all the stressing over getting things ready, I'm really looking forward to it now. If you are in the area, or are planning on coming, please do come and say 'hello' to me and Helen. I will be easy to spot, I'll be wearing a hat, and I'll be knitting. 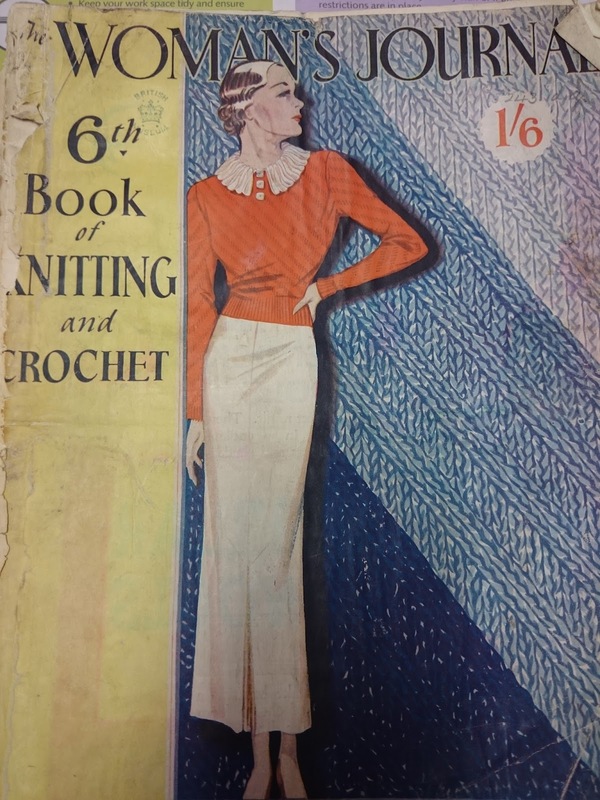 This pattern is from the Woman's Journal 7th Book of Knitting and Crochet from 1935. (I think). This is a scanned pattern from the British Library's archives. Actually it is a picture from my phone, as I forgot to scan this magazine, and quickly took some pics before having to give it back. I hope the text is clear enough. I chose it because it is a very simple design, suitable for a beginner. 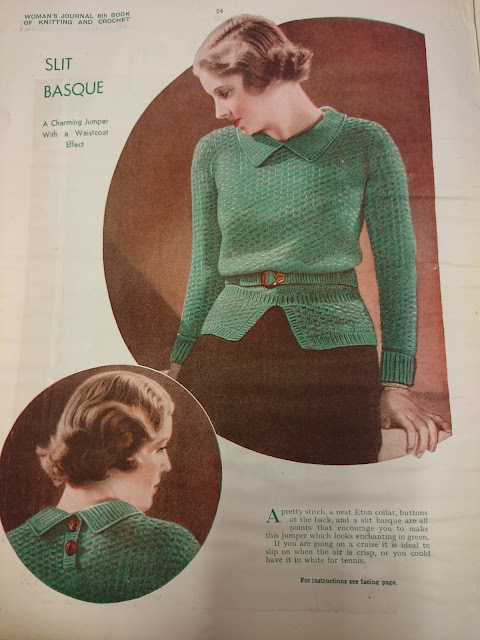 It has 'magyar' sleeves (I love that word), which means the jumper is knitted up and over, with the sleeves cast on as part of it. Which also means no sewing up of shoulder seams, or sleeves eased into armholes - hooray! 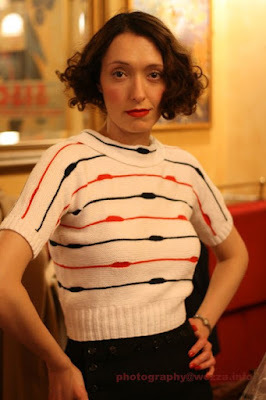 I have only knitted one jumper in this style before, and loved it. 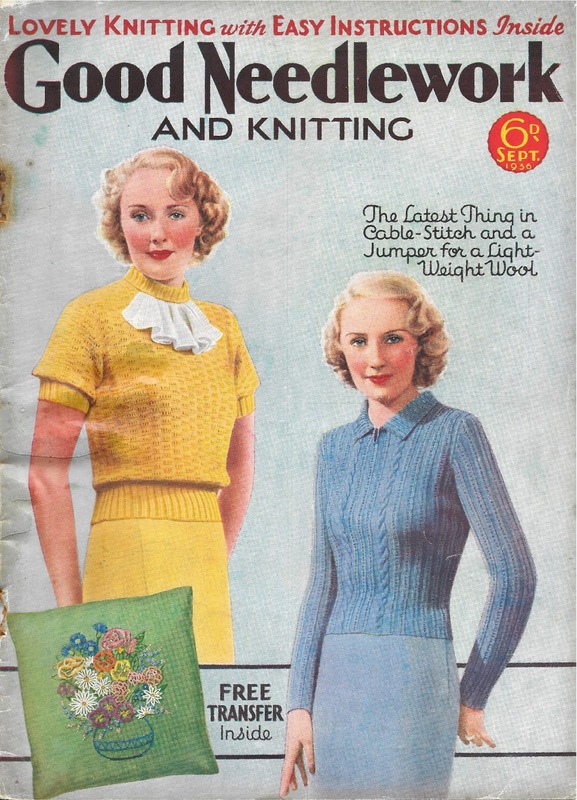 I have also done baby matinee jackets and jumpers in this 'magyar' style, as it was very popular in the 1930s and 1940s. 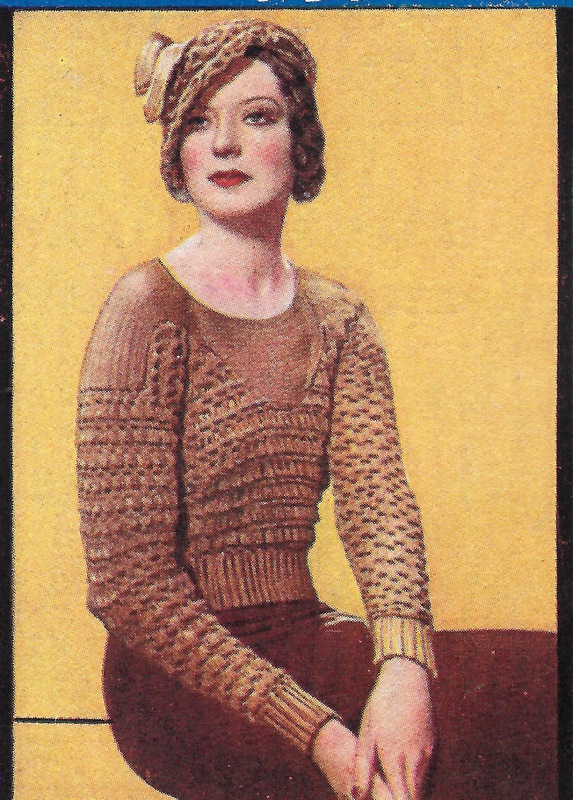 This is a pattern from a Beehive booklet from the 1930s, suggestively named 'Interlude'. 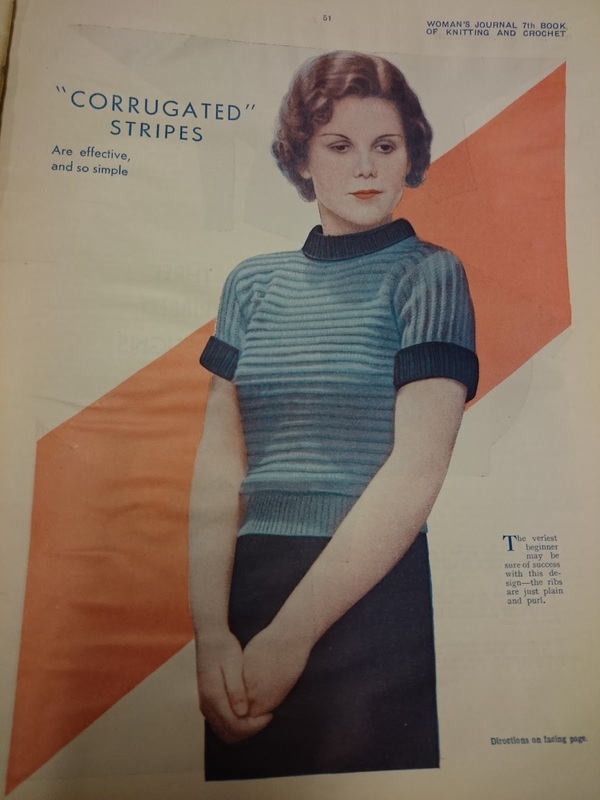 The pattern for ' Corrugated Stripes' is a simple 6 row repeat, with just knit and purl rows. The yarn used is equivalent to a modern 4 ply going by the tension. For a larger size, you could try using a DK weight, but go up a needle size too. 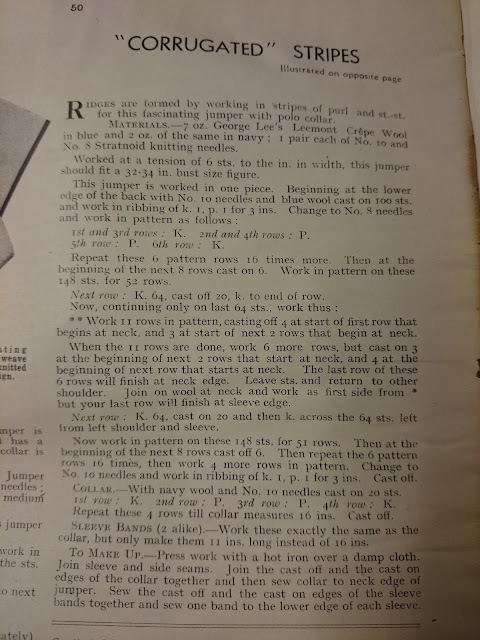 There are so many lovely patterns I want to share from the British Library, but I am finding the scanning very tricky, as Caroline (The Sunny Stitcher) has mentioned before. It is hard to get the bound copies to lay flat without damaging them, and I am so loathe to do that, as many are already in such a fragile state. 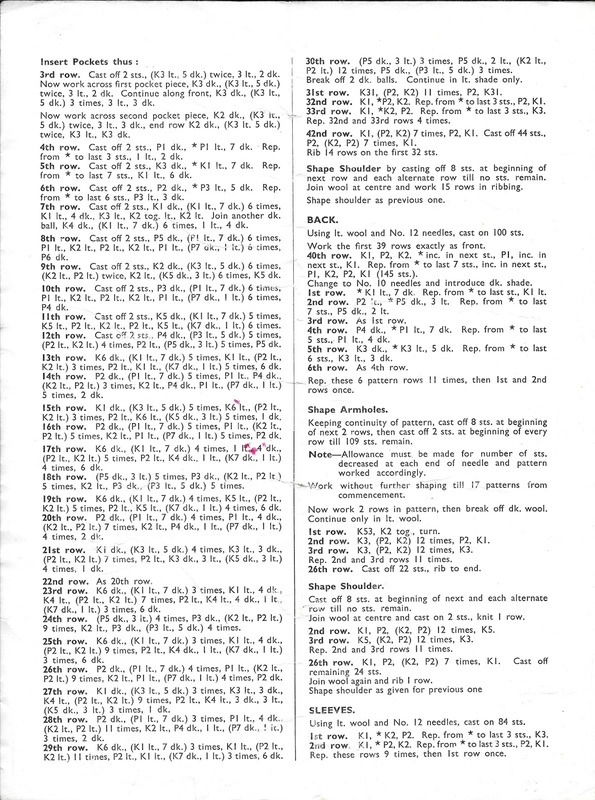 There is also a problem with glare from the scanner, which affects the text, but by tilting the magazine it seems to help. It is a trial and error process, which I will persevere with; weighting the pages down with tiny sand bags, beads and my hand obscured under black paper! 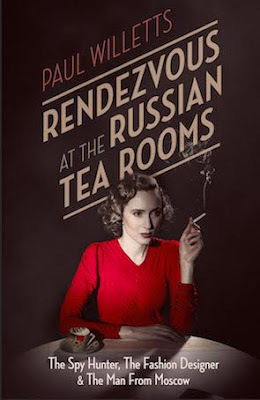 I've been invited to the launch party for a book called Rendezvous at the Russian Tea Rooms by Paul Willetts. The book tells the story of a little-known yet significant espionage episode, most of which took place between May 1939 and May 1940. It focuses on three central characters: Anna Wolkoff was an haute couture fashion designer whose clients included the Duchess of Windsor, and who was also a spy for the Nazis. Tyler Kent was a womanising American diplomat who also doubled as a Soviet spy. Maxwell Knight was an urbane and eccentric spy hunter with MI5. The lives of these three characters became entwined as they moved amongst London's elite society during the first part of World War II, jeopardising the secrets of the wartime government. Back in January, the book's author, Paul Willets, contacted me about being the model for the cover of the book. Unfortunately, I was in the midst of a horrid chest infection (which has left me with permanent damage to my lungs). I was in total denial about how sick I really was until just before the shoot was about to take place. I let him down terribly at the last minute, with only a weekend to find another model (which, thankfully, he did). 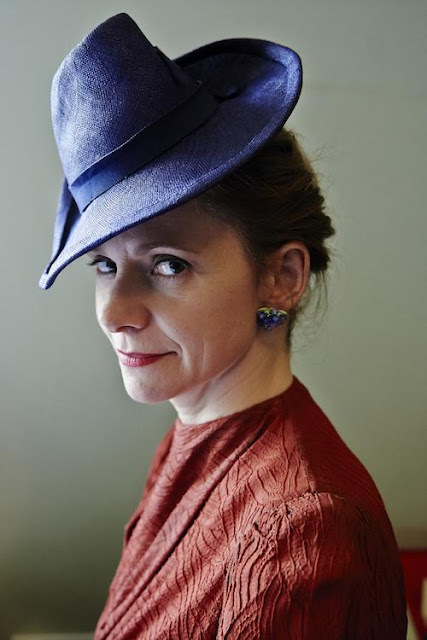 I loaned him some dresses that belonged to an actor friend, Emma Bown (below). When he stopped at the house to pick them up, he brought me a huge box of chocolates. Instead of being cross - which he had every right to be - he was so thoughtful and kind. A true gentleman. This is Emma Bown, and she is in the trailer for the book, here. I'm looking forward to dressing in something from the late 1930s, and having a fun night out. My good chum Simone will be accompanying me, and undoubtedly she will be dressed beautifully, as always. I predict by the end of the evening we will be in Cahoots!